Since 1979, the first Sunday after Labor Day has been designated National Grandparents Day. This special autumn holiday honors the grandparents in our lives, and serves as a reminder of the strength, history, and guidance those older than us may share. Military families are often unable to celebrate this special holiday with beloved grandparents due to living too far away. Consider connecting your military kids with seniors in your local area! 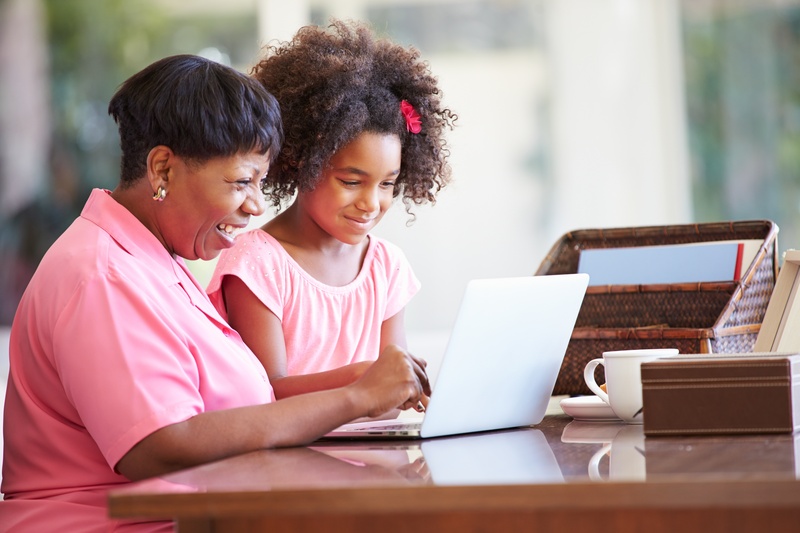 Thankfully, with today’s technology, grandchildren may be able to connect with their grandparents via messaging or video chat. But what if your child wants to bring a grandparent to the Grandparents’ Day event at school? Even if stationed miles away from family, there may be an option! Perhaps you can “adop” a grandparent in the local community. Not sure how to connect with older folks in your area? Here are three ideas! If involved in a local church or local organization, ask for names of senior citizen members who are in need of visitors. Often unable to leave their homes, these seniors may simply enjoy a chat with someone. A visit from a child may chase away the loneliness and bring warm sunshine to their day. Consider helping with the local Meals on Wheels program, delivering meals to the homes of elderly people. This program gives an older person something to look forward to, as well as a meal ready to eat. Stop by a local assisted living facility and speak with the director. Explain specific activities you and your children would like to do with the residents, such as joining them for a round of bingo or creating an easy craft project with them. This interaction is rewarding for the residents and may be an entertaining way for children to learn the value of time with elderly people. By connecting with a local senior citizen, a child may learn from that voice of experience and share a deeper appreciation for their own grandparents. When Grandparents Day arrives and you’d like to celebrate with those older than you, consider these 10 ideas. Decorate! Often seniors enjoy decorations for their door or for around their room. With this in mind, find simple-to-create craft ideas to make together. Play! Bring a game to play--anything from word play with Scrabble or recalling images with Memory Match. Garden! Most seniors enjoy gazing out the window at a pretty flowers or flourishing plants. Have them help with the planting chores and visit often enough to water and tend to their flowerbed or garden for them. Be an Entertainer! When they were in preschool, my nieces enjoyed “putting on a show” for the residents of my Grandma’s nursing home. This included dress-up clothes for several song and dance numbers, most likely inspired by episodes of “Barney” or “Sesame Street.” If your child likes to sing, dance, or tell jokes, have them share those talents for elderly folks’ enjoyment! If your child is learning to play a musical instrument, a senior citizen may be a patient audience as the child practices their music lessons. Read! With a younger child, bringing a favorite book and having the child read aloud to an older person is a good way to build the child’s reading and language development skills. With an older child, reading aloud the newspaper, magazine articles, or from a book is helpful for an elderly person who may not be able to see the text. Write! My Grandma loved sending greeting cards, but her handwriting abilities declined over the years. Especially at Christmas, she needed a helping hand with good penmanship to address the greeting card envelopes. Helping an older person write a card or letter may be an activity for an older child. Jotting down memories or stories that the older person shares could be another writing idea. Go Online! E-mailing inspirational stories, sending and receiving photos, connecting with family and friends via messaging or video software: today’s seniors may enjoy the options of online communication. If the senior citizen has access to a computer, an older child may be able to help guide them with proper use of it. Scrapbook! If an older person has a large collection of photos, an older child may help preserve those photos with fun scrapbook layouts or archival albums. Simply noting names of faces in the photos is a good memory challenge for an elderly person, and the child may learn from the stories and adventures that go with the photos. Pamper! Once a month, an enthusiastic bunch of junior high girls would visit my Grandma’s nursing home and give the ladies manicures. If an older child enjoys painting fingernails, this may be a fun way to share their artsy talent and pamper a stylish senior. Give! When a child gives of their time to bring happiness to another person, that gift in itself is priceless. Sometimes a small token may also brighten a senior citizen’s day. Perhaps a crayon drawing, a hand-written letter, a fragrant soap or lotion, or a pair of fuzzy socks--nothing too elaborate or expensive, just a little reminder that someone else is thinking of them. On Grandparents’ Day or during the upcoming holidays, if you’re stationed far from your own family, look for ways to reach out to those nearby. Doing so may make a positive impact on your military kids while warmingthe hearts of the elderly in your community.